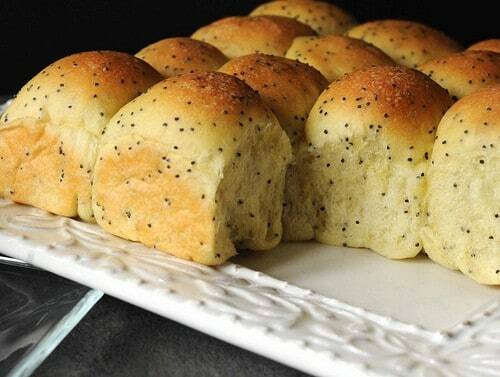 Poppy Seed Yeast Rolls are light and airy poppy seed dinner rolls with a touch of sweetness. Try them as slider buns with ham and swiss cheese. Directions for using a bread machine to mix and knead the dough are included. 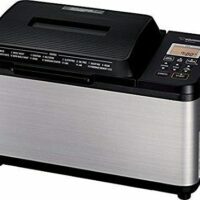 No bread machine? See recipe notes for alternative directions. WARNING: Do not eat these the day before taking a drug test. It’s true. Eating poppy seeds can result in a positive reading. Check it out on Snopes.com. But if you aren’t applying for a new job or on furlough from federal prison, I heartily encourage you to introduce yourself to these wonderful little yeast rolls. 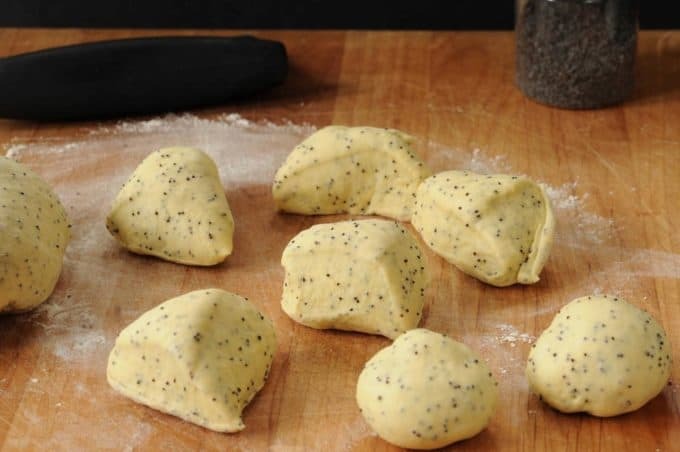 Add these Poppy Seed Yeast Rolls to your repertoire if you like poppy seed cake, muffins, or bagels. Try them spread with lemon curd or preserves. Take the savory route and make hot ham and cheese sliders. Perfect for a party. Whip up these rolls for Easter dinner, and then later, make sandwiches using leftover Easter ham and some honey or Dijon mustard. You don’t have to have a bread machine to make these but it’s easier if you do. Dump all ingredients in pan and set on the dough cycle. Wait till the dough has risen to double. Next, remove the dough from the pan, form into rolls and let rise again until double. Bake in a conventional oven. Voila! You have just made yeast rolls you’ll have to tie down to keep from floating off like a cloud. If you prefer to use a heavy duty mixer, see these directions. And one more thing: Unlike most homemade bread, these rolls will stay fresh and delicious for 3-4 days. This is important, so I don’t feel compelled to eat leftovers the same day! Divide dough in half. Cut each half into 8 pieces or 16 according to your preference. Form into balls. See video for an explanation how to form dough into balls. Place in 2 8-inch round or square pans sprayed with vegetable oil. Cover pans and allow to rise until double in a warm place. May take from 30 minutes to 1 hour. Bake in 350 degree oven for 11-14 minutes until brown. Let rolls sit on counter for about 5 minutes. Then turn out onto a towel or plate. Flip upright onto serving plate or tear apart and pile into serving basket. Where do I find just vanilla, can I omit it and just put vanilla extract? Also, how can I make this using the oven, since I don’t have a bread maker? You can definitely bake this bread in an oven. I always do that, even though I use a bread machine to mix and knead it. I added specific instructions for people who don’t have a bread machine in the notes of the recipe. You can use vanilla extract only. However, the vanilla butternut is easy to find at Walmart or you can order it online. It really makes these rolls special. Omg, I just made these and they are amazing!! I have made some great bread, but I only tried dinner rolls once (when I was very much a novice), and this is the texture that I have dreamed of achieving. Thank you so much for sharing! I am going to use the basic version of this dinner roll recipe for Christmas. Yuuuuum!!! Just want to say that these turned out amazingly well! Everyone enjoyed them at the afternoon tea. I liked them so much I’m going to do them again for a church event in two weeks time and I’ll probably use this loaf version of this at some point too. They worked fine without the butter extract in the end, thanks for the recipe and the advise. These look great! I’m going to make them for an afternoon tea on Saturday. 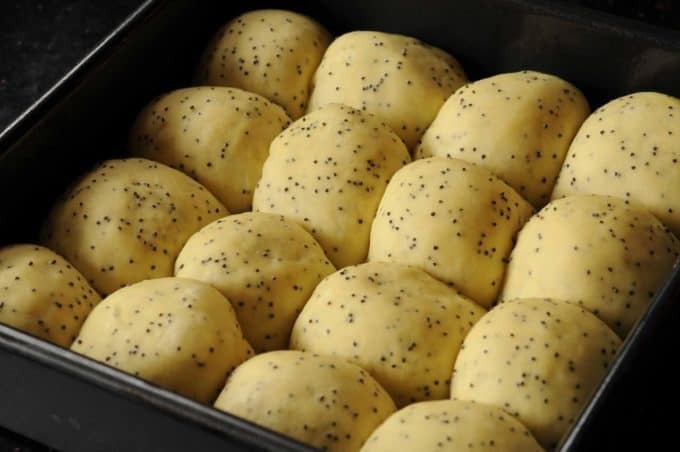 What was the size and hieght of the square baking tin did you use for the individual rolls? And will it make too much difference if I replaced the oil and butter extract with 1tbsp butter? (I don’t think butter extract/vanilla nut butter is readily available in the UK). Thanks. 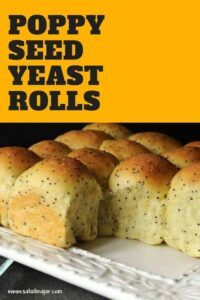 The rolls look awesome but I don’t eat poppy seeds how can I adjust the recipe to make just regular rolls. Thanks. Hmmmm, I’ve become addicted to chia seeds and wonder if they could be substituted for the poppy seeds? My concern is that chia seeds absorb moisture around themselves and might need to add more liquid? 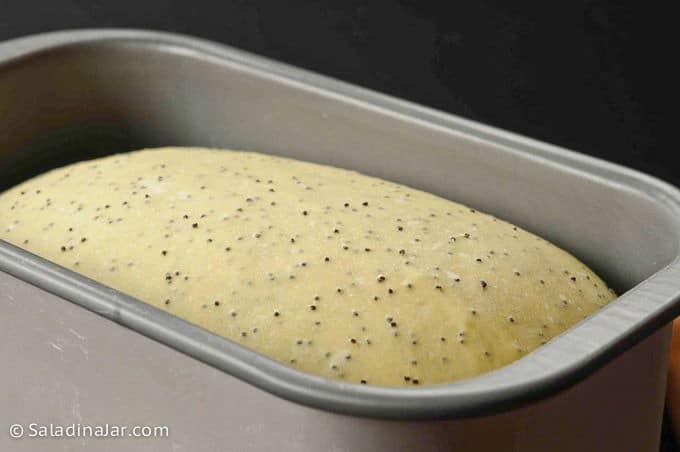 Have you tried using chia seeds in recipes for breads? wow thanks now i am scrued! 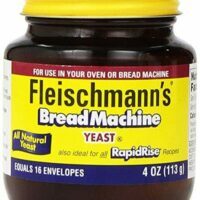 Mmmmm, 2 1/4 teaspoons bread machine or instant yeast. WARNING: Do not eat these the day before taking a drug test. It’s true. 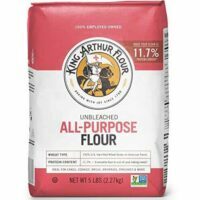 I love all of your bread recipes. I will be printing this one out for my new recipe book I am creating with your recipes and the Pioneer Women’s. Keep them coming. I’m lovin it!!! These look so good! I can imagine how awesome they’d be with lemon curd, yum! I made these yesterday and they came out PERFECTLY. They are my go to roll recipe now. Too bad I have sworn off bread for a while. Guess I will just have to quit reading your blog so I won’t be tempted. These rolls look delicious, and I love poppy seed. What do I have to do to resubscripe for the e-mail notifications? I was fired from a job because of cocaine use. I kept telling them it was a Lemon Poppyseed Cream Cheese pound cake. Honest. Paula, these rolls, and bread loaf and ….. wow, very impressive. They look like they belong in a book. Were you not a professional chef in this previous life (I think you were). I love these…. copying the recipe! 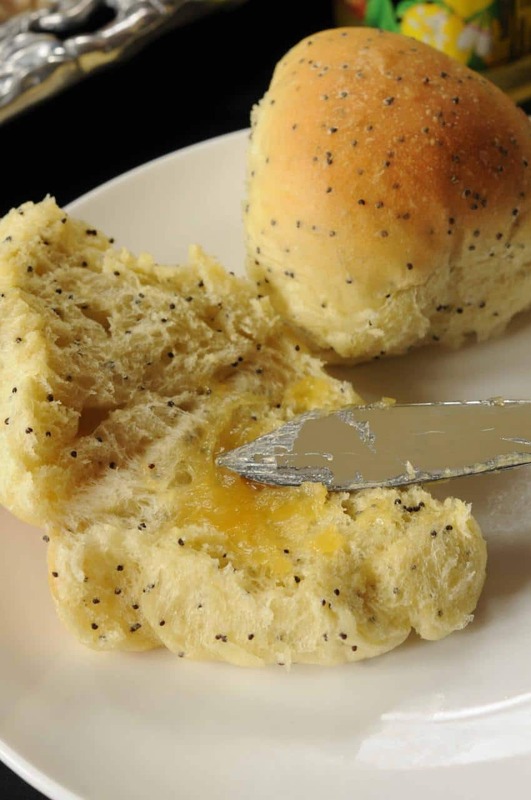 Yum… Poppyseeds! I really love those little things. Yum! These look good. You know I love all the bread recipes! Great looking rolls! I knew about not eating poppy seeds before a drug test. Read about it several years ago. Crazy fact isn’t it!